On Tuesday, Joel Sherman reported that some teams are wary of signing Johnny Damon because of how close he is to 3,000 hits. Three executives told Sherman that they were concerned Damon’s quest for the milestone has made him less patient at the plate, trading walks for chances to get a hit — an idea that was first observed by JC Mitchell at DRaysBay back in July. Sherman even cited FanGraphs data to show that in 2011 Damon swung at more pitches out of the zone than any other year for which we have the data. His walk rate took a hit, dropping to 7.9% — his lowest since 2005 and second-lowest since 1996. The Pitchf/x data show an increase in out-of-zone swings, but not quite as drastic as the BIS data. Although, if I use the left-handed batter-specific zone reported by John Walsh, I see a jump from 26% O-swing from 2007-2010 to 29% O-swing in 2011. I think the best thing to do is look at exactly where the extra swings are coming from. Here are swing-rate contours for Damon comparing 2007-2010 to 2011. Inside the 50% contour he was more likely than not to swing at a pitch, outside of it less likely than not. Pitches inside the 60% contour he swung at over 60% of the time. This year’s Hall of Fame ballot had a very weak pool of first-year candidates. Bernie Williams was the leading vote getter with just 9.6% of the vote, and the only member to break the 5% cut off to stay on the ballot. At the same time the 14 returning candidates saw their vote total increase by an average of 7.1%, and five had increases of over 10%. Many have suggested that there is a relationship between these two facts; that is, with few good first-year candidates to vote for there were extra votes for the returning candidates. Last year David Roher at Deadspin/Harvard Sports Analysis Collective noted that over the 2000s the average number of votes per HoF ballot was fairly constant, between 6.6 and 5.35. This would suggest that in years with strong first-year candidates there would be fewer votes for returning candidates and vice versa. I wanted to more explicitly test this relationship and see whether it extended further back than just the 2000s. I looked at every Hall of Fame vote from 1967, when the current voting rules were put in place. Along the x-axis is the average number of first-year candidates voted for. Along the y-axis is the average change in vote share for returning candidates compared to the previous year (here an increase from 60% to 65% would be denoted by 0.05). Early in the season Eno Sarris introduced us to Brian Wilson’s flithy two-seam fastball, a pitch Wilson claims to have added this year. Sarris’s GIF showed Jamey Carroll flailing wildly at Wilson’s newest offering. Wilson, 29, already had three years as a solid closer for the the San Francisco Giants, so the idea of him adding another nasty pitch is intriguing. With over half the season books and Wilson effective again this year — though his peripherals have taken a step back — I wanted to check in on that two-seamer. Today with a single and a home run Derek Jeter got his 2999th and 3000th hits, joining a group of just 27 other players to do so. Jeter is the fourth youngest player to reach the mark, having turned 37 on June 26th. Ty Cobb did it as a 34-year old while Hank Aaron and Robin Yount as 36-year olds. Pete Rose got his 3000th hit at age 37 and 21 days, a few days older than Jeter. Inspired by Steve’s HR-pace graph — and this great New York Times career-HR pace graph — I wanted to see how Jeter’s hit pace compares to the other members of the 3000-hit club. Below is a graph showing hits accumulated by seasonal age. The graph is interactive, so that you can hover over and click on the names at the left to compare the pace of different players. It is a canvas element so it only works in modern browsers (i.e., no IE8 or older). Here is a sample image if it doesn’t work on your browser. The age is seasonal age not actual age. So in the graph Tris Speaker and Stan Musial get to 3000 hits faster because they did it sooner in their age-37 season even though they were older when it happened. The data come from Retrosheet. Where available it is daily, but for pre-1918 seasons it is just yearly (see Ty Cobb for an example of yearly versus daily data). 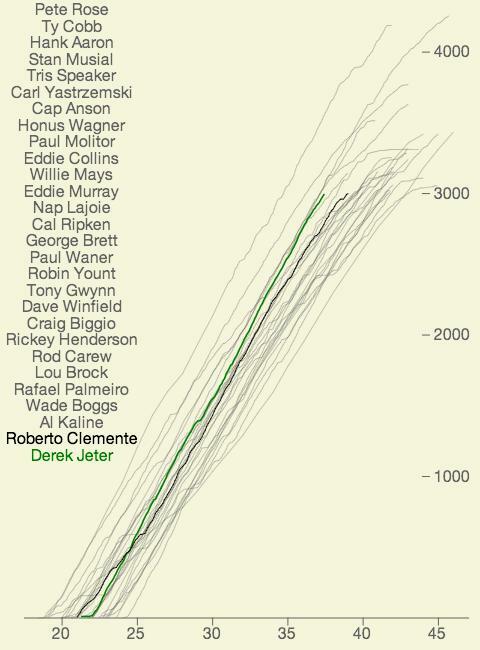 Looking at Jeter you can see he got a relatively late start, but then he accumulated hits at a very good clip. By 30 he had more hits than most of the 3000-hit club members did at that age. Since then he hasn’t slowed down as much as most, and he is way ahead of the pack for his age. Given his legend-like status and contract through the 2014 season (with the player option) — even with his talents diminished — he should get a good number more plate appearances before he retires. He should almost surely move into the top ten (by passing Eddie Collins at 3315 hits) and maybe the top five (by passing Tris Speaker at 3514 hits). Until then congratulations to a guy who has already had a great career. One interesting aspect of the proposed realignment is the effect it will have on team travel. As Dave Cameron noted without division there would be fewer games between geographically close teams, and more between teams farther way from each other — travel will increase. Last Thursday On the Forecheck, a hockey blog, posted the total distance each NHL team will travel in the upcoming 2011-2012 season (hat tip Tango). That made me think that, in light of realignment, it would be interesting to see how much teams are already traveling — and how much variation is there between teams — as a baseline for the current system. Over the weekend Buster Olney reported that Major League Baseball and the players’ union discussed a possible plan for realignment. The plan would move the Houston Astros, or possibly the Florida Marlins, to the AL so that both leagues would have 15 teams; eliminate the three divisions within each league; have the top-five teams from each league go to the playoffs; and require an inter-league game every day (because of the odd number of teams in each league). There is lots to consider with such a realignment — fairness, logistics, etc. — but I wanted to look at a single aspect: how will this plan would affect the number of competitive playoff races at the end of the season? Jair Jurrjens is having a great year so far. Obviously, he is getting lucky as he doesn’t have the talent of his league-leading 1.51 ERA. Still, his xFIP of 3.47 is considerably better than his career xFIP of 4.22. This is largely thanks to a big drop in walks, from his career rate of 3.24 to just 1.51 this year. This success is even more striking because his fastball is 1.5 mph slower than he has previously thrown it — usually not a sign of improvement. Carroll Rogers reported that Jurrjens, 25, picked up a new grip on his two-seam fastball from Jonny Venters, and has been using it since his April 16th start against the Los Angeles Dodgers. But the velocity is down on both his two-seam fastball, from 91.4 mph to 89.4 mph, and his four-seam fastball, from 91.4 mph to 89.7 mph. So I don’t think the change in two-seam grip is responsible for the slower fastballs. He is throwing his two-seam fastball at about the same frequency as he has previously. James Loney is having a horrible start to the 2011 season. His wRC+ of 58 is by far the lowest of his career and is the seventh worst in the league. That kind of performance from first basemen is unacceptable. But the Los Angeles Dodgers have started him in every one of their 51 games this year (@truebluela notes that Loney has started in the past 120 Dodgers games). With Loney at first for the foreseeable future it is important to see what are the causes of his problems. Yesterday, in a game against the Houston Astros, Aroldis Chapman entered the game in the top of the 8th inning and faced four batters; he walked three of them and hit the other. That leaves Chapman with a league-leading 11.37 walks per nine innings, 16 walks and two hit batsmen in 12.2 innings. In his 15 innings last year (including the playoffs) he walked just five batters and hit one. What’s Wrong with Derek Jeter? At 36 and just after signing a three-year deal, Derek Jeter is off to a horrible start in 2011. With 120 plate appearances Jeter has a wRC+ of just 57, and the main reason is his complete lack of power. Of his 27 hits only two have gone for extra bases — both doubles — leaving him with an ISO of 0.019, the worst in baseball.